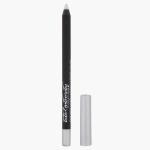 Create a bewitching look with this metallic eyeliner. In a sleek pencil form, it imparts a strong colour. Made to last long, it ensures minimal touch-ups.